I finally get to watch a Husker football game this season! We don’t have cable and this week’s game is finally on a channel that we get. I’m even happy that it starts later – that means that I can watch after we put the kids to bed! Better get my grocery shopping done – using Nicole’ list of what’s on sale this week, of course. Baked Potato Soup – Milk is on sale! Potatoes are on sale. I got bacon and cheese in the freezer. Time for soup! Egg Salad Sandwiches – There are some good sales on eggs this week and egg salad is easy! There’s lots of variations, so use your favorite or try the one that I have linked here. Spaghetti & Meatballs – Ground beef is at a stock up price! Make a huge batch of meatballs and have spaghetti. Or meatballs subs. Or meatball pizza. French Onion Burgers – Use some of that ground beef for these burgers! Even when it’s cold outside and you don’t want to grill, you can have burgers! I make these in a skillet on the stove. Grilled Pork Chops – this is the only way that I make pork chops. Given the amount of pork chops in our deep freeze, we need to eat this more often – we love it and it’s easy! 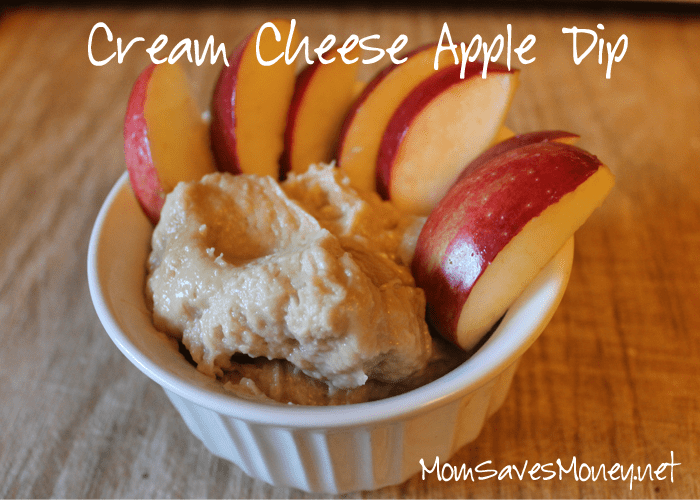 Looking for a yummy way to eat apples? Try this dip – it’s become a favorite in our house. And it couldn’t be easier. Slice up some apples – any kind will do and combine these 3 ingredients and you have a great snack. This week, we’ve eaten it cold. And warmed up. Both are great.